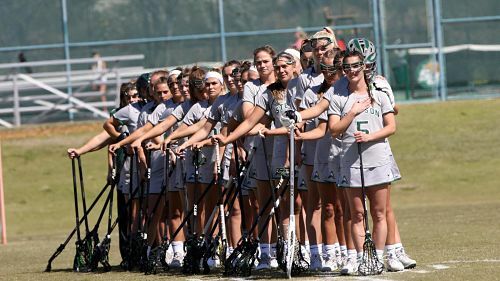 As Stetson lacrosse head coach Christy Leach begins her fifth season with the Hatters, she does so with one of her youngest squads to date. The 2019 Hatters feature 15 freshmen and sophomores on a roster of 24 student-athletes and that young group faces the first of many tests when the Hatters open the season on Sunday at home against Quinnipiac. A young roster, coupled with the loss of seven seniors from the 2018 squad, has forced the Hatters to make some changes for the new season. So, what is Stetson changing? The one area where perhaps the Hatters haven’t had to make as many changes is along the back line. Stetson returns the bulk of its defense from last season, including Sarah Trupp, Taryn Cook-Grisewood, Emily McGowan, Christina Nikolai andAnne Ryan Lanz. Stetson’s top returning player is sophomore Riley Reagan. A preseason All-ASUN Conference selection, Reagan burst onto the scene last year as a freshman for the Hatters, earning second-team all-conference and ASUN All-Freshman Team honors. She ended the regular season leading the ASUN with 35 assists. Her 53 total points in 2018 are a Stetson program record. As good as Reagan was as a freshman, Leach sees better days ahead. All of the offensive responsibility won’t fall on Reagan, however. Also returning are Karli Maguire (33 goals), Shelby Lehmann (26 goals), Jaclynn Levy (13 goals) and Sandra Stephan (12 goals). As preseason practice has moved along Leach has been pleased with the quick transition of her freshmen and the positive steps taken by an experienced sophomore class. With such a large group of underclassmen, the Hatters will rely heavily on their captains for leadership this season. Quinn Roe, Sandra Stephan and Sarah Trupp have fully embraced their vital roles. As far as goals are concerned, the Hatters have some lofty ones. The quest to reach those goals begins on Sunday. NextDistrict 6 Preview: Can Ponte Vedra Win The FHSAA Title?